Serena Williams has had a love-hate relationship with the US Open. She has won six championships but has also been in the thick of controversy. A look back at her highs and lows. "I'm thinking, 'Should I scream? Should I cry? What should I do?'" Serena Williams ended up doing both. With her 6-3, 7-6 (4) win over Martina Hingis, the 17-year-old Williams became the first African-American woman since Althea Gibson in 1957 and '58 to win America's championship. She also became the first member of her family to win a Grand Slam title. She and sister Venus have combined to win a total of 30. It was a matchup of the two previous US Open champions. It was the first final between sisters in US Open history. It was staged in prime time. It was Venus versus Serena. An astounding 22.7 million viewers tuned in that night to watch. The match, unfortunately, didn't quite live up to the hype. Big sister beat little sister 6-2, 6-4; they combined for 52 unforced errors. It ended with Venus whispering to Serena at the net: "I love you, all right." Aretha Franklin opened the festivities; Serena Williams closed them. 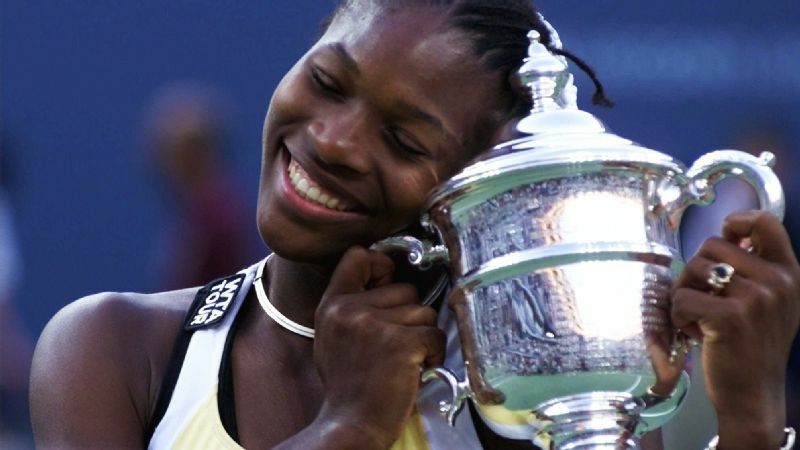 In a rematch of the 2001 final, Serena got revenge against Venus with a 6-4, 6-3 victory. "I think Serena was the best player in the tournament this year," Venus said. It was the third straight major title for Serena and the third straight major final in which she beat her big sister. Four months later, at the Australian Open, Serena beat Venus in yet another major final to complete the first version of the Serena Slam -- holding all four Grand Slam titles simultaneously. "I'm very angry and bitter right now. I felt cheated. Shall I go on? I just feel robbed." 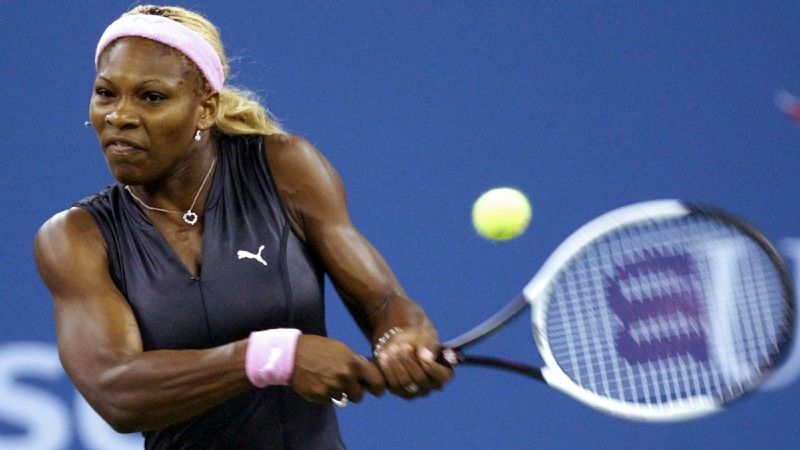 After missing the 2003 US Open with a knee injury, Serena Williams was feeling the pain of numerous bad calls during her 2-6, 6-4, 6-4 loss to Jennifer Capriati. After a particularly poor overrule by chair umpire Mariana Alves in the third set, Williams asked, "What the heck is this?" Later, John McEnroe, calling the match from the booth, answered Williams. "This is ridiculous," he said. She had dipped well outside the top 100 in ranking, but Serena Williams restored order on the court with a 6-4, 7-5 win over Jelena Jankovic to claim her third US Open title. Williams did not drop a set during the tournament, and the win propelled her back to the No. 1 spot in the world rankings. "I can't believe I'm No. 1," she said. "It's been so long." 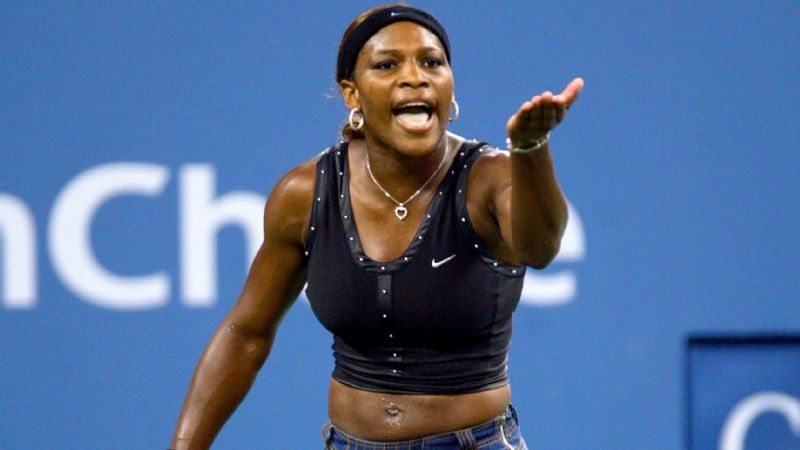 Did Serena Williams cross the line? All we know for sure is that a line judge claimed she did. At 5-6, 15-30 in the second set, Williams was called for a foot fault on her second serve, giving Kim Clijsters match point. 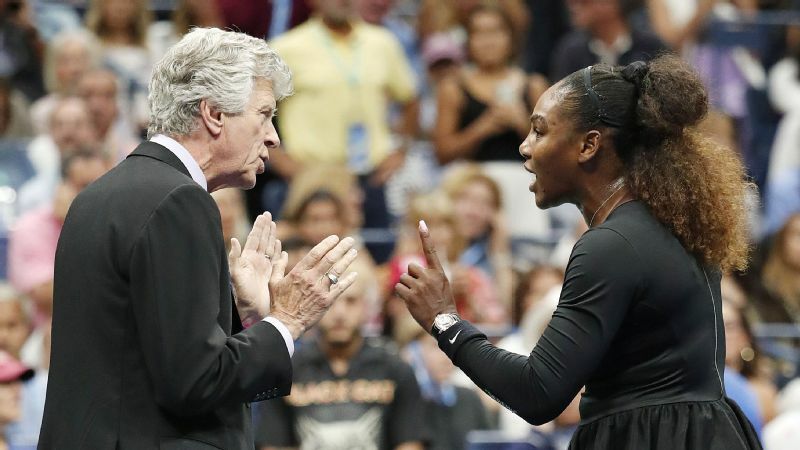 Dropping the F-word liberally, Williams told the line judge she was going to cram the ball down her throat. With the crowd booing, officials huddled to determine what to do. The decision? A penalty point was awarded to Clijsters, ending the match. "The normal feelings of winning a match weren't quite there," Clijsters said. "I hit a winner, but I guess it didn't count. It wouldn't have mattered in the end. Sam played really well." Down a set against Samantha Stosur and facing a break point in the first game of the second set, Serena Williams crushed a forehand and shouted "Come on!" before Stosur lunged for a return. 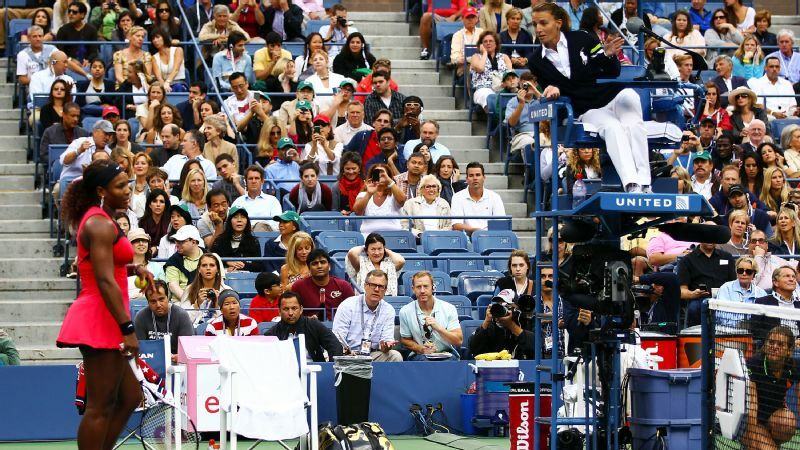 Chair umpire Eva Asderaki ruled that Williams hindered Stosur's ability to play the point and awarded the point to Stosur. Williams, in disbelief over the call, told the official she was "unattractive inside" and later said, "really, don't even look at me." The Australian went on to a 6-2, 6-3 win. "I really was preparing my runner-up speech, because I thought, 'Man, she's playing so great.'" 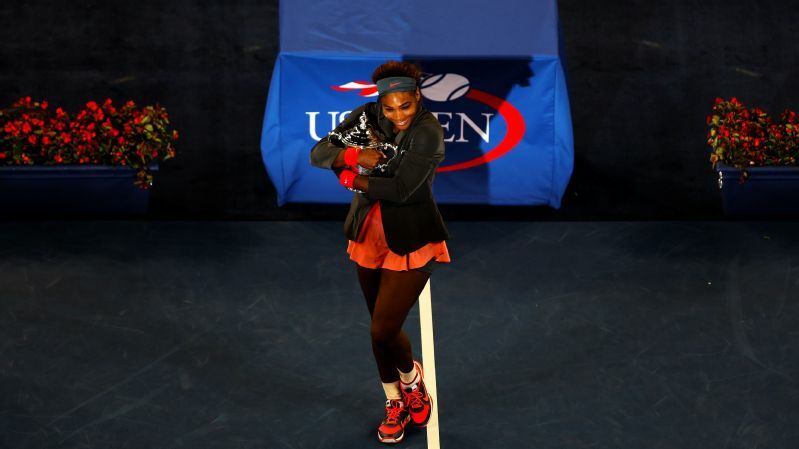 Turned out there were 40 million reasons for Serena Williams to celebrate instead. 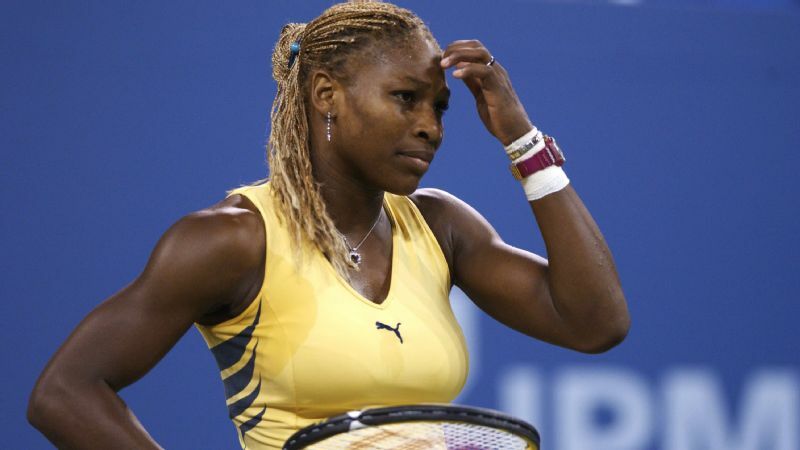 Two points away from elimination against Victoria Azarenka, Williams won the last four games for a 6-2, 2-6, 7-5 win. It was her 15th Grand Slam title and fourth Open championship. "Yeah, three decades -- the '90s, 2000s, 2010s," Williams said. "That's kind of cool." She also became the first woman to earn $40 million in prize money. After a rematch of the 2012 final, Serena Williams left Arthur Ashe Stadium with her 17th Grand Slam title and her fifth US Open. She also became the first woman to earn $50 million in prize money. She had to work for it, though. 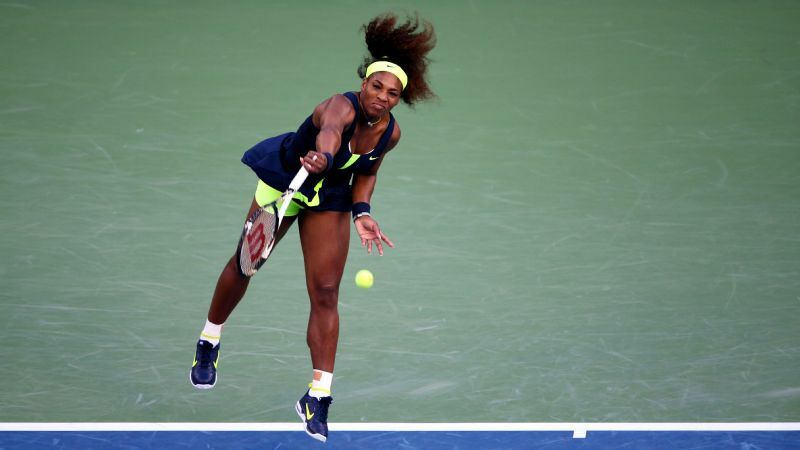 In windy conditions against a tough Victoria Azarenka, Williams won 7-5, 6-7 (6), 6-1. Former President Bill Clinton was among the 23,584 in attendance. "I definitely felt the love," Williams said, "so thank you all so much for the support." 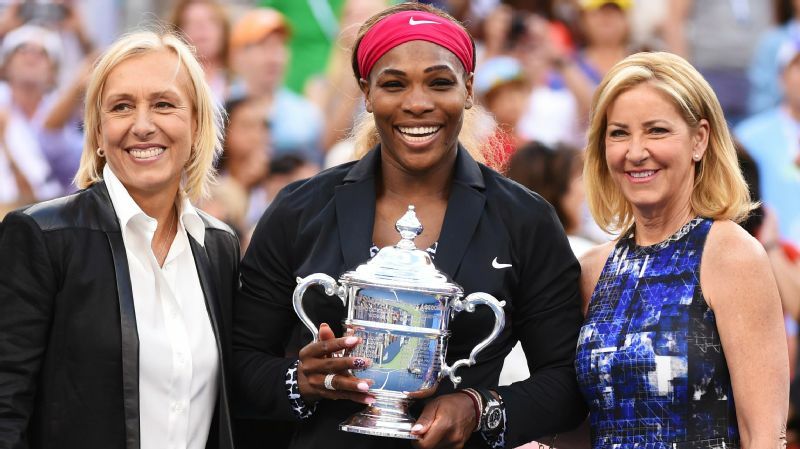 Martina Navratilova and Chris Evert, members of tennis royalty, joined the celebration after Serena Williams won her sixth US Open and tied Navratilova and Evert with 18 Grand Slam titles. Williams never lost a set en route to a 6-3, 6-3 win over Caroline Wozniacki in the final. "It is a pleasure for me to win my first Grand Slam here and then this No. 18," Williams said. "So I'm really emotional. I couldn't ask to do it at a better place." Serena Williams had won the Australian Open. The French Open. Wimbledon, too. She was a US Open trophy away from becoming the sixth person to win all four Grand Slam tournaments in a calendar year. Then unseeded Roberta Vinci pulled off one of the biggest surprises in tennis history, beating Williams 2-6, 6-4, 6-4 in the US Open semifinals. "For the American people, for Serena, for the Grand Slam and everything," Vinci said. "But today is my day. Sorry, guys." 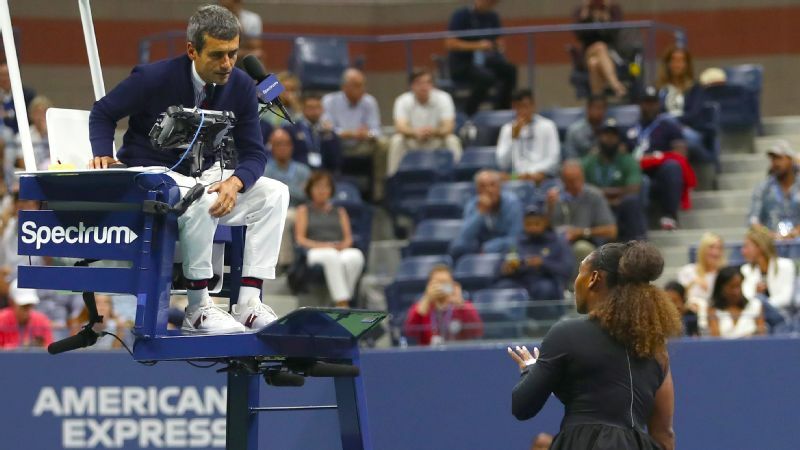 First Serena Williams got a warning from chair umpire Carlos Ramos for coaching. Then she was assessed a point penalty for smashing her racket. 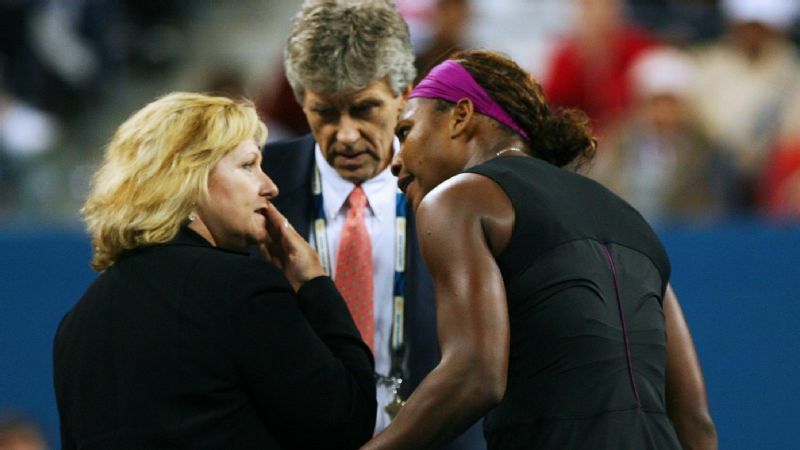 Then, down a set and 3-4 in the second, she was given a game penalty after calling Ramos a "thief." Naomi Osaka took it from there and won her first Grand Slam title 6-2, 6-4. The stunning loss left Williams at 23 career major titles, one away from tying Margaret Court for most all time.